Also known as the Nigg ferry and claiming to be the smallest carferry in the United Kingdom, she was used on the Cromarty-Nigg service for years and years and years. In this disguise she looks actually quit cute, neat & tidy…….not the best looker though. Later she was painted blue……made her a bit less neat. Stuart C, who recommended this little thing to me as a potential object of ridicule send along some pictures as she is now (moored at the Island of Mann). Things didn’t improve for her at all…..especially the addition of the outhouse, also called the Forward Lounge doesn’t really suit her! I also have the slight impression that it might be a bit more heavy than she can handle. Thanks Stuart, for the tip & the pics! Well I suppose beauty is in the eye if the beholder, but the Cromarty Rose is only in Douglas Harbour as she is on route to England, where her Martin Woolls, is sailing Cromarty to her new base in the Bristol Channel. She has operated the Cromarty-Nigg ferry since 1987, replacing a passenger only service. 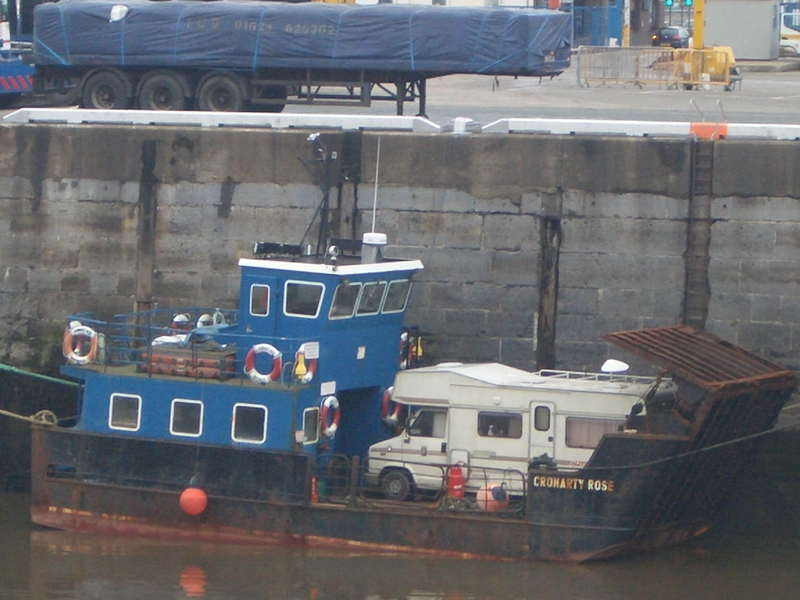 From Cromarty, where she left last week, she has travelled down the Caledonian Canal and along the West Coast. 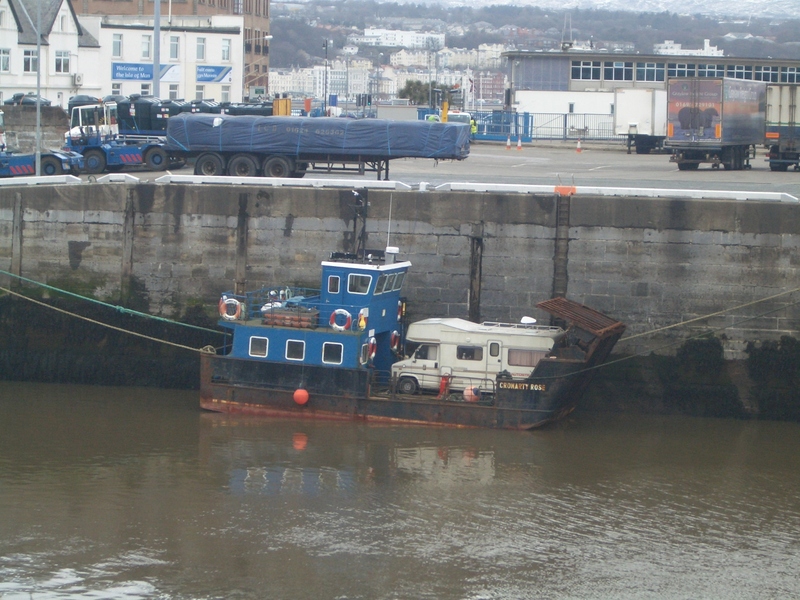 The picture above shows the new owner’s ‘accommodation’ for the journey — a caravan parked on the ferry’s turntable. I heard on the grapevine that she took on some water in the Irish Sea, and was escorted in Douglas by the Lifeboat, for work on her pumps. Under the new name of Westward Ho!, she will run a service to the privately-owned island of Steep Holm, about five miles offshore from the seaside resort of Weston-super-Mare. Southampton Marine Services has a £500,000 contract to build a new Cromarty-Nigg ferry to carry four cars and 50 passengers. The new – and as yet un-named – ferry, will arrive in Cromarty in May. The New vessel is a stretched version of the Rose, itslef based on the design of CalMacs Island Class six car ferries. maroon paint. I think I prefered that to the Blue. the blue did her no favor, no. However, I do like that little “come hither” crook of her finger, fore.